NOTE: The 2018 Spring Meeting registration is being done on the MSHP website. If you are a KCHP member that opted to add Missouri affiliates (GKCSHP or MMSHP) to your KCHP membership, then a record was created on the MSHP website to facilitate email distributions. During the registration process you will be given the option to "Login" into the MSHP website. This is not the same password that you have established on the KCHP website. You also can skip the "Login" process and just proceed to registering for the spring meeting. 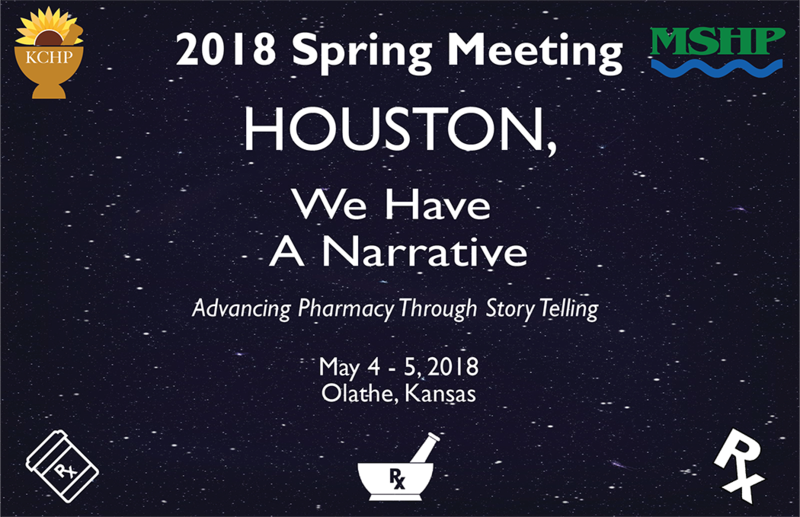 Pharmacists that are interested and willing to support a technician or student to attend the 2018 Spring Meeting,please select "Pharmacist / Technician or Resident Joint - Full Registration" option. Then enter the name and email of the individual that you want to sponsor when you get to the end of the registration form. We understand that you might not be able to attend the spring meeting yourself, so why not give the opportunity to one/many of your technicians and/or students to attend the spring meeting. Just help them register and pay for it with your credit card. Please contact Jim Andrews if your hospital would like to support multiple technicians/students to arrange for an invoice to be sent to you. On behalf of MSHP and KCHP, we are looking forward to a most successful spring meeting, May 4 - 5, 2018 in Olathe, KS but we need your help. The Reverse Exhibit will be on May 4, 2018 and we are asking for you to hold this day to participate in 3 hour commitment. This time will allow vendors that have paid up to $1500 per person to spend 5 minutes in a one on one information exchange with key hospitals and systems in MO and KS. In years past, we have raised more than $55,000 dollars and can only be as successful as participants willing to work the tables. I look forward to your representation as you feel appropriate. You can either register yourself by selecting “* Reverse Exhibit Pharmacy Directors” as the option when you sign up or you can just simply let Jim know and I will register you as a “Reverse Exhibit Pharmacy Director”, then you will be all set. Please contact Jim Andrews at the KCHP office either by email or phone (314-416-2247), if you have difficulties registering for the Spring Meeting. 11:15-12:15 Continuing Professional Development: What Does That Even Mean? 2:00 - 3:00 DIR FEEs: Explaining the Unexplainable and Finances and Budgets, Productivity Grids, Revenue, and you: Pharmacy Finance and Why It's Important. 9:10-10:10 Nitrofurantoin Renal Dosing Cutoffs: Reappraising the Evidence; Oncologic Immunotherapies: What Every Pharmacist Needs to Know; 22 is the New 24: Caring for the extremely premature infant in an adult hospital ; Allometric Dosing of Vancomycin in Obese Patients. 10:15-11:15 Role of Biosimilar Infliximab and Adalimumab in Adult and Pediatric Inflammatory Bowel Disease. 2:00-3:00 Suggamadex: What is all the Hype? NOTE: Schedule and sessions are subject to change. Professionals interested in sponsoring or exhibiting at the 2018 Spring Meeting should check out the Exhibitor Guide and complete the Registration form. The 2018 KCHP Annual Meeting will feature award presentations for the following categories. Please submit your nominations for the following categories by April 9, 2018. This year's Fund Raiser Event will be at Stone Pillar Vineyard and Winery on Friday, May 4, 2018. There will be networking, live band, party, food and drinks. Plan to attend the fundraiser.